4 hours, from 9 am to 1 pm. A unique occasion to be at the Botanical Conservatory “I giardini di Pomona” to learn together ancient techniques of preparing the typical “fico maritato”: dried figs filled with almonds and lemon zest. The day will begin with a walk among the figs, tasting all sorts of different varieties and harvesting straight from the trees the best ones for drying purposes. 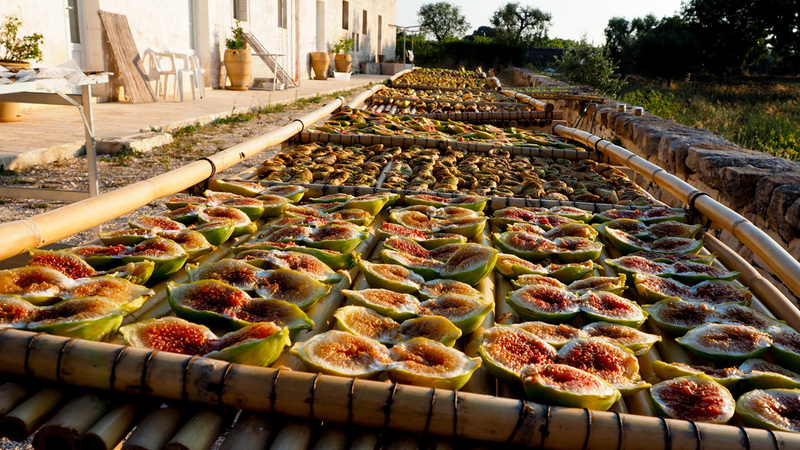 Under the shade of the pine trees we will than learn how to cut and open figs and arrange them on “sciaie”, the traditional trays for drying. Finally, we will fill dried figs with roasted almonds and lemon zest. The period in which the cooking class takes place is from 20 August to 20 September. The experience is suitable for an international audience. Languages spoken are: French, English, German, Spanish. Reservations must be made 5 days in advance. You can experience the cooking class exclusively, that is, for up to 2 people. a jar of “fichi maritati”.